I’m a child of late summer evenings, but equally a fan of the coming autumn chill. The air is crisper, justifying the second (or third) cup of lazy morning coffee waiting for the sun to show itself and warm the day. I love wool and eagerly await the chance to pull my favourite sweaters out of storage. I don’t mind the rain or the temperature drops, even with all the time I spend on my bicycle exposed to the blustery autumn elements. A Swedish mantra states it best: “Det finns inga dåliga väder, bara dåliga kläder.” (Meaning: there’s no bad weather, only bad clothing.) With this thought in mind, I pride myself on a nice selection of winter jackets and rain jackets, suitable for the snow or downpours, for the office or the outdoors. After all, as a hiking boots and high heels kind of girl, one has to be prepared for what may come. In line with this same Swedish saying then: I’ve only experienced good weather (well… almost). In addition to my professed love of wool, goose down and Gore-Tex, there are a few other things I love about the changing season. 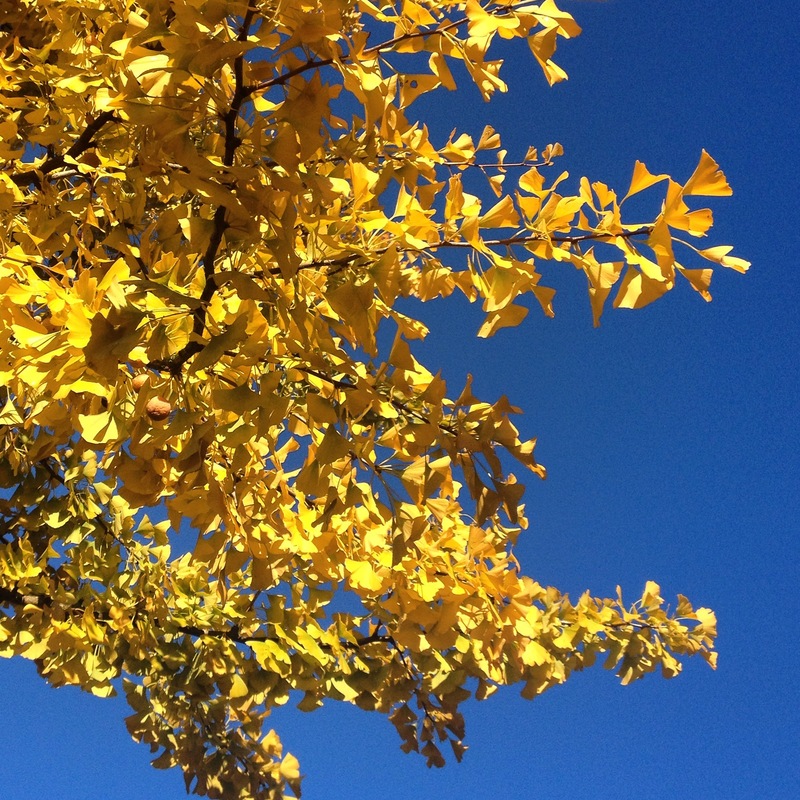 Of all the seasons, autumn has the most distinct smell. Spring is of scented flowers and pollen; summer is of berries to harvest; but autumn whiffs of the Earth returning. Leaves gently fall to the ground replenishing the soils below as the trees pull their energy inward to prepare for the coming winter. An evening rain on the decaying leaves, followed by the morning mist and lingering dew, amplifies the season’s scents. I breathe them in deeply on my morning commute, panting and peddling as fast as I can to catch the train just on time. Autumn is of changing temperatures, of wooded scents, and perhaps most evidently of trees that burst into colours of sunshine and fire. Undoubtedly this annual autumn colour explosion is best explored in nature: on a forested path or a mountain trail. Still, tree-lined cities also show off their colourful autumn rainbows, chasing away the gloom of a rainy autumn day. Every year is the same; yet every year is beautiful. In Amsterdam, urban autumn is not just about tree-lined streets or parks; it is the autumn leaves that clog the canals, or the late season sunsets that bounce off these waterways reflecting warm light on the surrounding brick buildings and their giant picture windows. Perhaps unsurprisingly, I find this season best experienced cycling alongside Amsterdam’s canals. 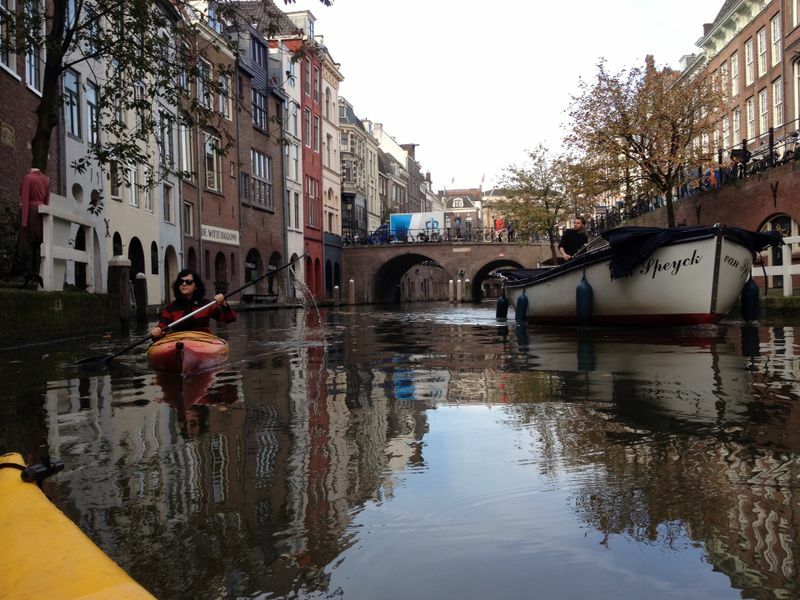 Another alternative: kayaking the canals of Amsterdam’s southern neighbour, Utrecht. Utrecht (population 330,000) is the Netherland’s fourth largest city. For centuries, it was an important religious, academic and transport hub due to its central location. Utrecht University dates to 1636 and is the largest university in the Netherlands. During the Dutch Golden Age, when trade and power moved to Amsterdam, Utrecht lost much of its strategic significance; but it never lost its charm. 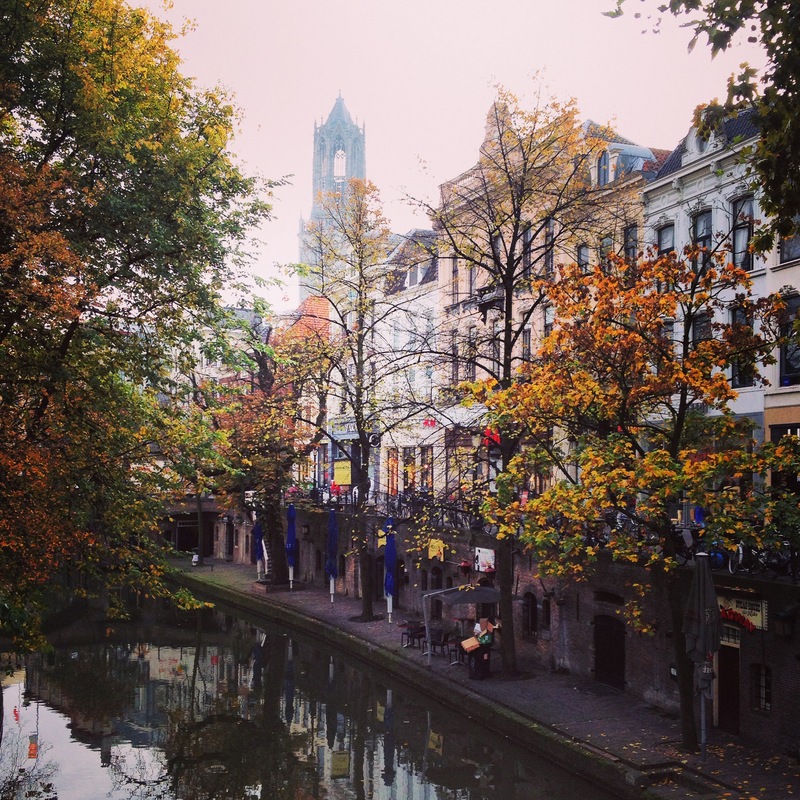 The Guardian has called Utrecht one of the World’s Unsung Cities. Indeed, it’s an enchanting place with a medieval centre full of low-lying canals. One can live, shop or dine, literally kissing the water’s edge. But don’t get too close. Centuries of dirt and filth have left these canals murky and mysterious. Still, while swimming isn’t recommended, a leisurely kayak is. In my continuous quest to find “nature in the city” in cities like Seattle, Stockholm or Seoul, Utrecht offers a distinctly Dutch twist. After all, where else can one kayak next to ancient canal-side warehouses, stare up to medieval towers, watch cyclists bounce over brick paths or enjoy falling leaves cluttering murky waters. While Amsterdam is famous for its boat rides, a kayaker has to compete with motorboats and giant tourist barges that dominate the waters. Utrecht’s more relaxed pace is suitable for the kayak. And with fewer canals, it’s harder to get lost. Still, there are enough waterways to explore for shorter or longer tours. 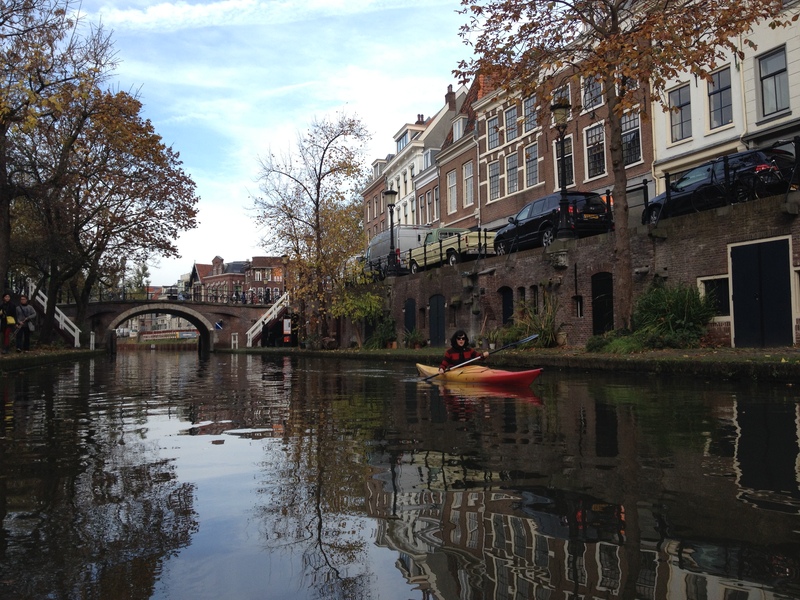 Utrecht kayaking is enjoyable in every season; but autumn is my favourite – especially on a sunny afternoon. Brightly coloured leaves are complimented by deep blue skies, flanked by grey waters. 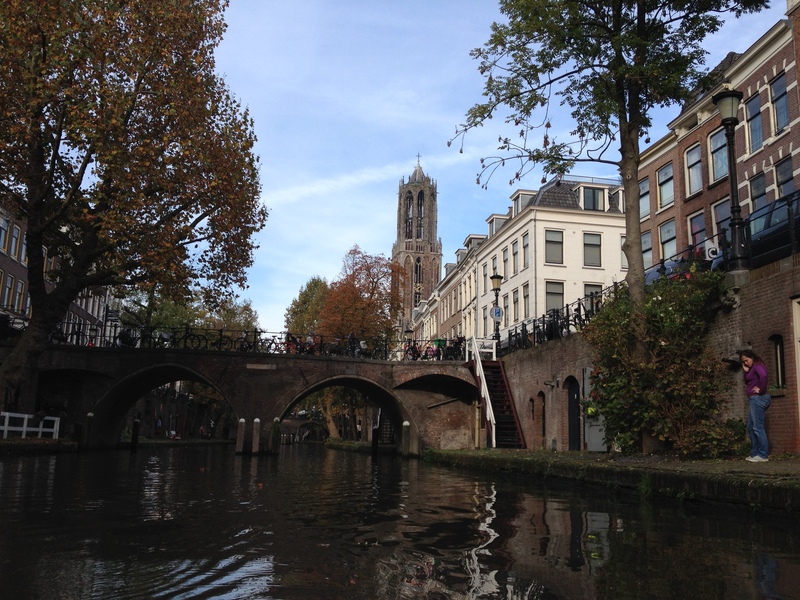 Tourists point their cameras up at Utrecht’s Dom Tower, or down to us – often asking where they can do the same. Urbanites on extended lunch breaks sit at the water’s edge, wrapping their fingers around warm cups of coffee discussing business strategies or politics to justify a delayed return to the office. On a recent trip to Utrecht my friend and I justified the same, taking advantage of a long conference lunch. But instead of coffee, we choose a kayak ride. After all, we are PhD candidates studying cities and climate change: how better to understand this than in cities so intimately connected to water? It’s research… Admittedly, this was my first time kayaking in high heels; however it doesn’t require much legwork so we decided to take advantage of the afternoon’s sunshine.Feeling like a mix of a Bond girl and a sorority girl, we visited Kanoverhuur Utrecht on Utrecht’s Oudegracht (a 10-minutes walk from Utrecht Centraal). The staffers at this friendly small business examined our attire with some scepticism, however kayaking through the slow-moving canals isn’t overly challenging and they trusted us to their boats. For less than 10 EUR we enjoyed a wonderful alternative lunch break: gazing up at the cyclists, the Dom Tower, the ancient buildings and trees painted in orange, red and yellow… all the while paddling under ancient bridges, through leaf-chocked waters. 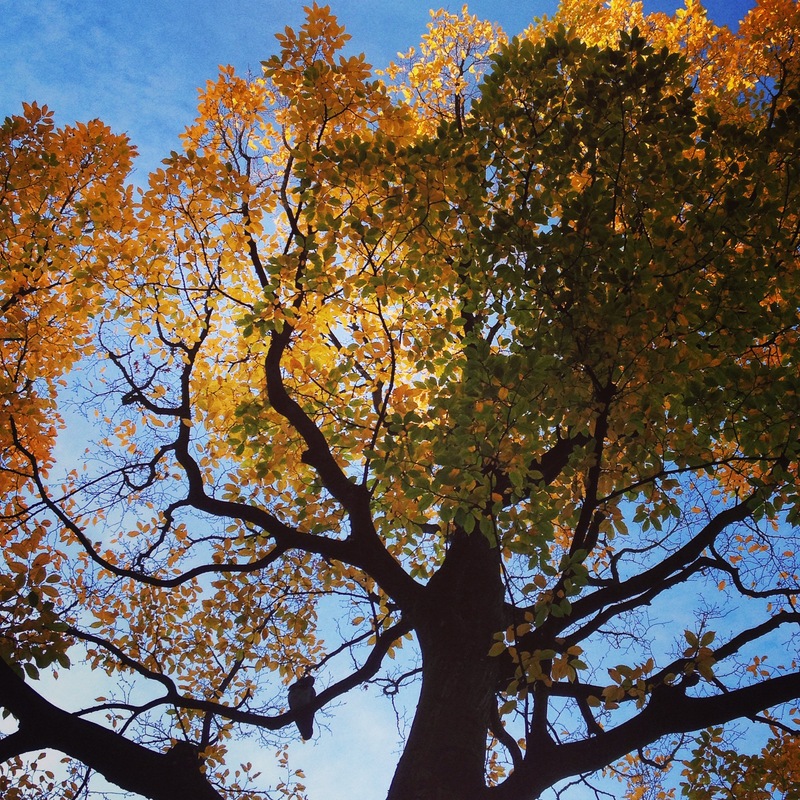 My craving to find nature in the city fulfilled once again….